For the first Saturday of January, SOUL Lifestyle is hosting the first ever soiree where young up&coming bloggers from the south (Davao & CDO) get to meet, chat and exchange fashion inspirations & experiences for the first time! Lots of firsts! Great way to start the year, isn't it? I would love for you to partake in the Bloggers' Soiree thru dropping by SOUL Abreeza to meet other Davaoeno bloggers and witness a style challenge they will participate in with me! I have been waiting for so long to meet my readers and this would be a great first for us all! 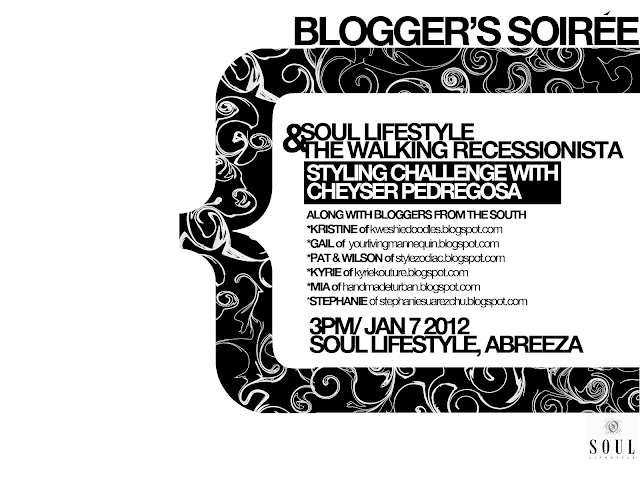 2 of my readers get to sit with us--me and other bloggers--in a fashion show at Abreeza right after the soiree. I will tweet tomorrow night (7-8 PM) how to win those 2 passes! Lets take photos and exchange twitpics! I'd love to attend it!